Ac Milan started their league campaign in a blistering pace as they demolished their opponents Lecce 4-0 with a wonderful performance especially by Ronaldinho and Alexandre Pato. The “Duck” scored his first brace in Serie A this season and could have easily had two or three more goals, however Thiago Silva and Fillipo Inzaghi completed the job for the Brazilian striker. It was an exciting atmosphere in San Siro as the home side take on newly promoted side, Lecce, with presence of the club’s new signing Zlatan Ibrahimovic, sitting on the stance along with Milan’s patron Silvio Berlusconi and Vice President Adriano Galliani. Eager to put out a show for their new teammates, the Rossoneri started the first half in a splendid fashion as they performed a wonderful attacking football. Brazilian young striker, Alexandre Pato opens the score with a wonderful shoot a pretty wide angel, while Thiago Silva added the second one after taking advantage of a scrimmage in front on Lecce’s goal. Dominating the game and creating tons of chances, the Rossoneri finally added the third goal before half time after Pato rounding the goal keeper after receiving a great through pass from Ronaldinho. After a Hollywood style of presentation for Ibrahimovic at the break, Milan started the second half with a slower pace from the first half as they seemed settle to just keep the ball. However, the Rossoneri still managed to create few chances that were either saved by Lecce’s keeper or hit the bar. 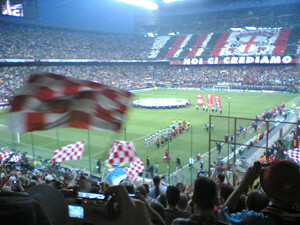 Luckily, minutes before the game ended, Inzaghi managed to wrap the game for the home side making the day a perfect and wonderful for all Milanisti. Taking a look from what Milan offer from this game, it should be noted how Massimiliano Allegri has managed to transform the side into a very organized and tactically brilliant team especially their first flawless first half performance. Despite taking the pedal off a bit in the second half, the Diavolo Rosso still managed to show some wonderful play at times which managed to awe the crowd. Although people can say, it’s only Lecce but for those who follow Milan closely can pretty much see that there’s something different from the way the team especially the seniors played on the game. It would certainly be interesting on how would the Rossoneri’s attack will be once Ibrahimovic joins them on the field, surely it won’t take long before that happens. Overall, now the fashion capital club have send a warning threat through all of their competitors, the Red and Black giant looked more than ready to challenge anyone this season.